-Preserve the natural environment and promote natural drainage systems. In fact, the East Clayton Neighbourhood Plan speaks to creating a pedestrian-first community with buildings that putting their best face to the street and parking tucked behind buildings (out of sight). Surrey has been successful in creating a pedestrian-first community in the residential areas, but hasn’t been as successful in the commercial areas. 188th Street and 72nd Avenue were meant to serve as high streets, but most of the commercial development has gone into auto-oriented strip malls along Fraser Highway to date. 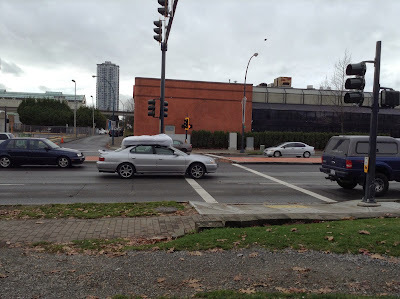 While Surrey could have made Fraser Highway into a multi-modal boulevard, instead it is treated like a Provincial Highway with high speeds and buildings that turn their back to the road. General land-use map of East Clayton. Click image to download PDF version. While on the bus, I noticed that there is a new development that is being built at the corner of Fraser Highway and 64th Avenue. This area was originally to be a mixed-use, live/work area, but it now going to be a strip mall. 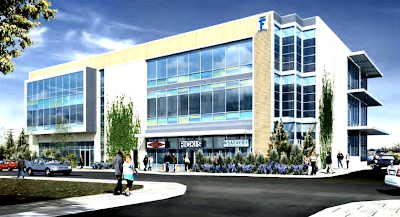 Rendering of Mosaic Clayton Market at Fraser Highway and 192nd Street/64th Avenue. Note that parking is not to scale. 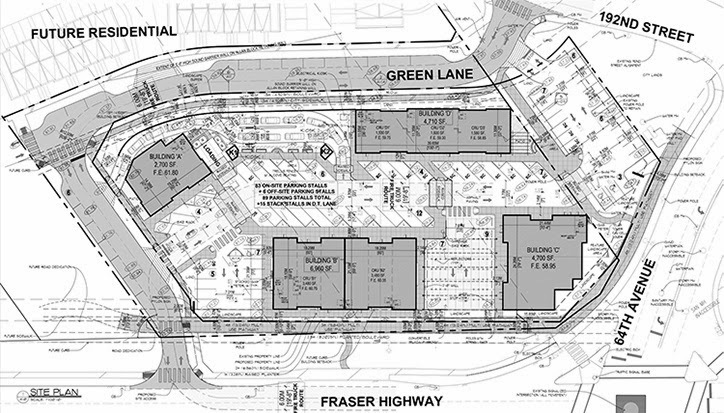 Site plan for Mosaic Clayton Market at Fraser Highway and 192nd Street/64th Avenue. Click image to enlarge. 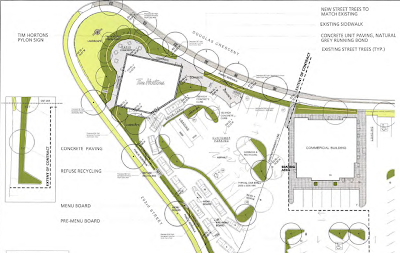 As you can see from the site plan, the project does a far better job of being pedestrian-friendly than the current strip malls in East Clayton, but I believe its design could have been improved. 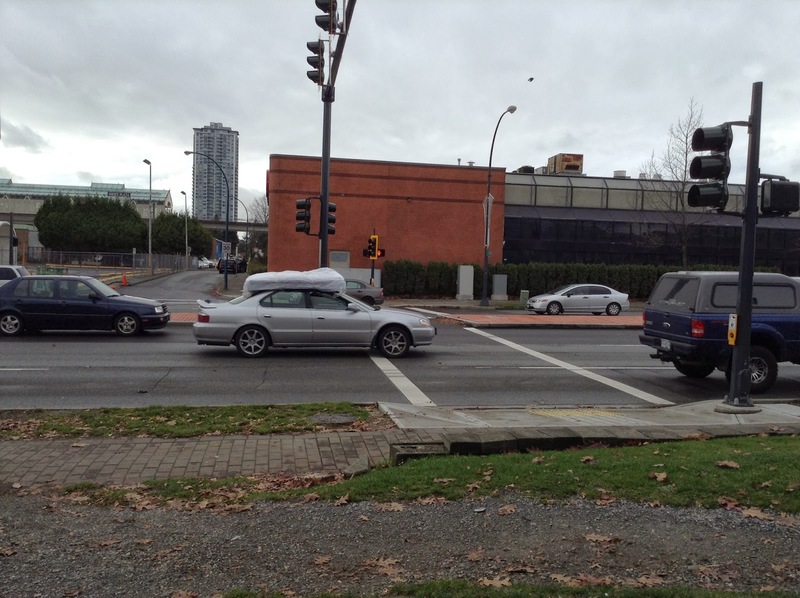 The project puts its best face forward on its internal road; it does not prioritize pedestrian access on Fraser Highway, its green lane, or 192nd Street. The biggest issue though is that a large drive-thru will be built between the future residential area and the commercial area. 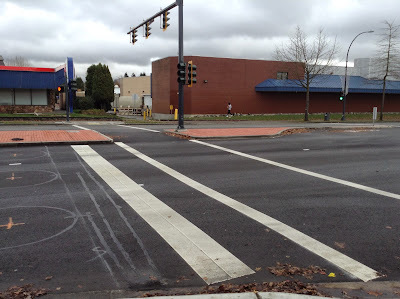 If the vision of East Clayton is to be pedestrian-friendly, drive-thrus should not be allowed. The drive-thru signals that the mall is an auto-oriented area. 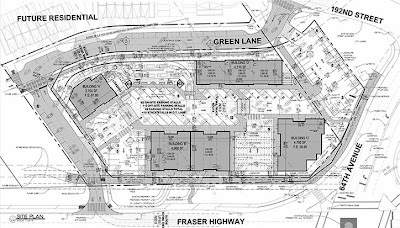 I have to give the City of Surrey credit for not allowing the future office area to be developed into a strip mall, but I have to wonder why they have compromised the vision of East Clayton by allowing auto-oriented retail development in a community that was meant to be pedestrian-oriented. One of the basic requirements to create a walkable high street is to have shops, restaurants, and cafes that go right up to the edge of the sidewalk. White Rock, Downtown Langley, and Fort Langley are some of the walkable places in the South of Fraser, and all have this basic design. A surefire way to kill walkability is to break up these pedestrian-oriented streets with surface parking lots and vacant lots. Downtown Langley and Fort Langley both have surface parking lots and vacant lots that reduce the walkability of these areas. In fact, the City of Langley basically razed a complete section of its downtown over the last few years, replacing it with surface parking and ugly blue fencing. While these areas will hopefully be developed into buildings that enhance the pedestrian realm, right now they are destroy it. What if there was something that could be done in the interim to make these places contribute to creating a walkable community. Portland, OR has its share of surface parking lots in both its core and older walkable neighbourhoods. The last time I was in Portland years ago, many of these places were under-underutilized and created dead zones. Last week when I was back, I noticed that many of these surface parking lots had temporary, permanent food carts at the sidewalk’s edge. Seeing how successful this concept was in bring livelihood back to the street, it would be good to try this in places like Downtown Langley and other location where there is underutilized space and dead zones. These are interim uses that would be replaced when economic makes sense to build mixed-use building with ground level shops and services. The concept could also be extended to pop-up retail as well. This would certainly do more to improve places like Langley City than community killing surface parking lots. 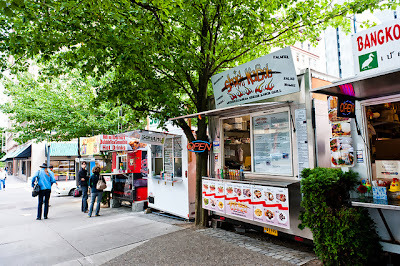 The City of Portland has a website about their food cart program and a guide called “No Vacancy! is an exploration of temporary use of vacant space” which contains information about this program. Last Thursday, I took Amtrak down to visit Portland for a mini-holiday. I hadn’t been to Portland for about five years, so it was interesting to see what has change in the region and what has not. Portland is known for its investment in public transit and as being a multi-modal transportation leader with its bike, transit, and pedestrian-friendly communities. While Portland's core (circled by Interstate 5 and 405) contains some of the most walkable communities in North America, outside of the core things are a different story. According to the latest National Household Survey for the City of Vancouver, 30% of all trips to work are made by public transit with 52% of trips to work by car. In the City of Surrey, 13% of all trips to work are made by public transit with 83% of all trips to work by car. Like Metro Vancouver, Metro Portland contains multiply municipalities. 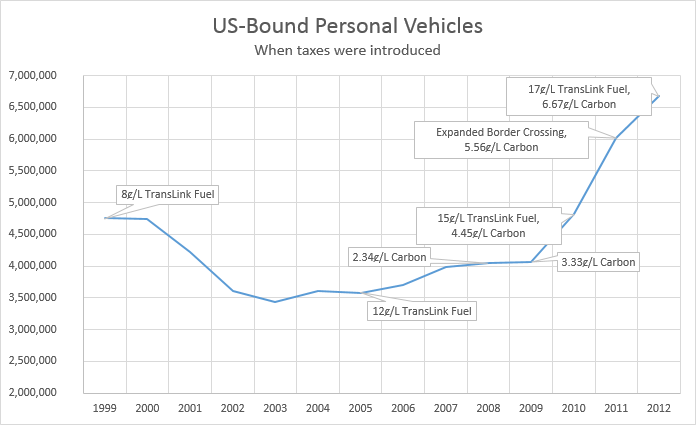 According to the 2012 American Community Survey 1-year estimates in the City of Portland, 11.1% of all trips to work are made by public transit with 66.8% of all trip to work by car. In Vancouver, Washington (which is similar to Surrey), 4% of all trips to work are made by public transit with 88% of all trips to work by car. 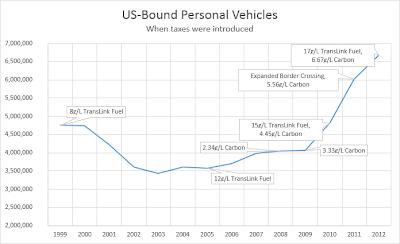 Why is Portland with its investment in biking, transit, and walking more auto-dependant than Metro Vancouver? Transportation infrastructure combined with land-use choices shape the accessibility of a community. No more clearly is this required combination more evident than in Portland. The Pearl District, which is part of central core of Portland, was transformed into a walkable community by combining mid-rise, mixed-use development with a streetcar network. While I was taking the MAX light rail system in Portland, I was surprised at how the vast majority of station stops where still in low-density, auto-oriented areas. In Metro Vancouver, higher-density mixed-use communities are built around major transit stations and corridors. I did not notice this in Portland. 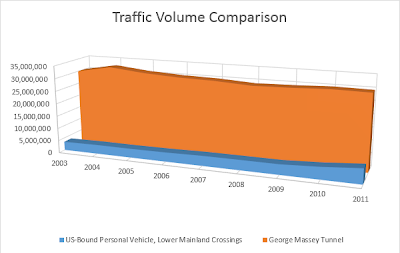 For example, the low-density, auto-oriented neighbourhoods that the MAX Yellow line goes through have changed very little since the line was opened about a decade ago. There could be several reasons for this. Local and regional government policies and politicians which guide land-use might need to be changed. There could also be community opposition to change. Social-economic factors also plan their part, but I think there is also another issue at play in Portland. Metro Portland's frequency transit network. Includes TriMet buses and MAX light rail. Click image to enlarge. In Metro Vancouver, the SkyTrain runs every 2 to 10 minutes depending on the time of day. Metro Vancouver also has an extensive frequency bus network that run 15 minutes or better service 7 days a week. In Portland, MAX lines run about every 10 minutes during peak weekday period, but you can wait 20 to 30 minutes for a train outside of the peak periods. The frequent bus network also only provides services every 20 minutes outside of peak periods and isn’t as extensive as TransLink's network in Metro Vancouver. I found myself having to look at the MAX light rail schedule this weekend when planning my trips. For a rapid transit system, this is not a good thing. Portland has similar funding challenges as Vancouver. More service is needed, but money is not available. While Portland’s transit network may be underfunded today, it has a light rail grid that stretches out to almost all parts of the region. When Portland solves its funding challenges, it will be able to ramp up service. It seems to me the biggest challenge for Metro Portland will be to export the walkability found in its central core to other parts of its region; something we’ve done a better job of in Metro Vancouver. Last week, I posted about how critical the Agricultural Land Reserve is for the long term success of our region. I also posted about how the Provincial government is looking at dismantling the Agricultural Land Commission which would have a disastrous effect on sustainability in our region and the rest of the province. It appears that Metro Vancouver feels the same way. I thought I’d share some quotes from their latest Regional Planning and Agriculture Committee Meeting. The ALC is a critical partner for implementing Metro Vancouver’s Regional Growth Strategy (RGS) “Metro Vancouver 2040 Shaping our Future”, adopted by the Board on July 29, 2011. The RGS explicitly states the importance of protecting the supply of agricultural land and promoting agricultural viability in collaboration with the Province and the ALC. The policy to maintain the Urban Containment Boundary not only helps to concentrate growth in urban areas, but also provides predictability and efficient use of financial investments in utility, road and transit infrastructure. In addition, lands designated for agriculture are essential for agriculture economic development, food security, as well as the future well-being of residents. c) ensure adequate consultation opportunities for the Metro Vancouver Board and all local governments in the region. 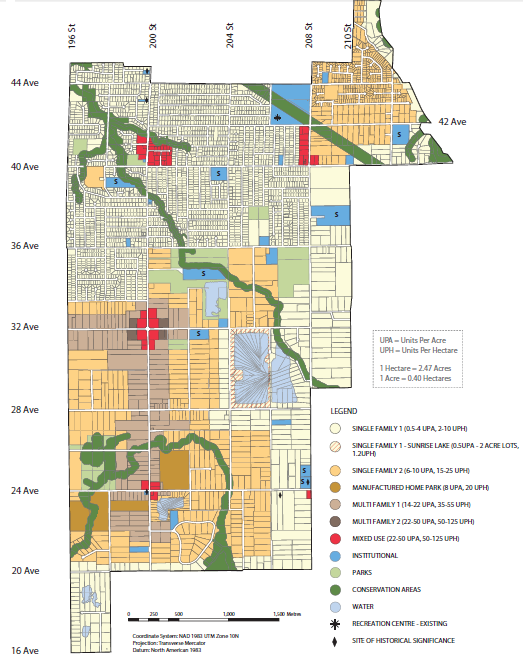 Metro Vancouver and the Township of Langley are not seeing eye-to-eye at the moment when it comes to regional land-use. 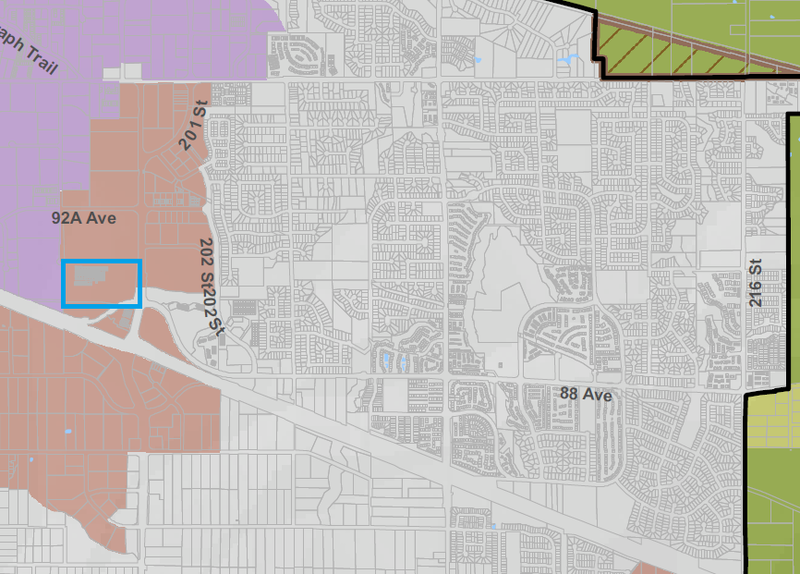 Metro Vancouver recently rejected the Township of Langley’s proposal to allow housing in the Agricultural Land Reserve. It also rejects the Township request to remove land from the regional Mixed-Employment zone. At the same time, Metro Vancouver and the Township of Langley are in court over the proposed University District. It appears that the region is taking a firm stand on the urban growth boundary and regional zoning which is part of the latest regional growth strategy. One of the complaints I’ve heard from some people in the Township is that the Vancouver/Burnaby axis of evil is trying to snuff out the economic potential of Langley, and bullying the Township via Metro Vancouver. I had a look at voting record from the Metro Vancouver Agricultural and Regional Planning Committee meeting on October 4th were they recommended denying the Township’s request to update the regional growth strategy. 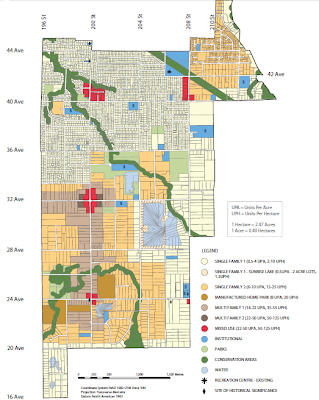 Surrey, Richmond, Delta, the Township, Maple Ridge, and Pitt Meadows all contain a large amount of land that is in the Agricultural Land Reserve. Delta, Surrey, and the Township also have a large amount of land that is in the Industrial/Mixed-Employment regional zones. 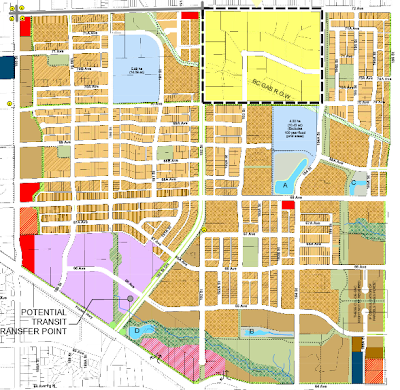 Beside the Township, the only other municipality that supported the Township's request to add housing within the Agricultural Land Reserve was Delta. No municipality supported the removal of land from the mixed-employment zone. Delta has been pretty outspoken about regional governance and TransLink, and is working on putting housing in the Agricultural Land Reserve. It's no surprise that Delta supported the Township. It is interesting that Richmond and Surrey, which both have large sections of their municipalities in the Agricultural Land Reserve, did not support the Township of Langley. While some people would like to make this a Vancouver vs. South of Fraser issue, this is not the case. It really is a matter of sticking to the regional growth strategy that all municipalities in the region agreed to which support the livable region. Willowbrook is a regional town centre according to Metro Vancouver’s regional growth strategy. 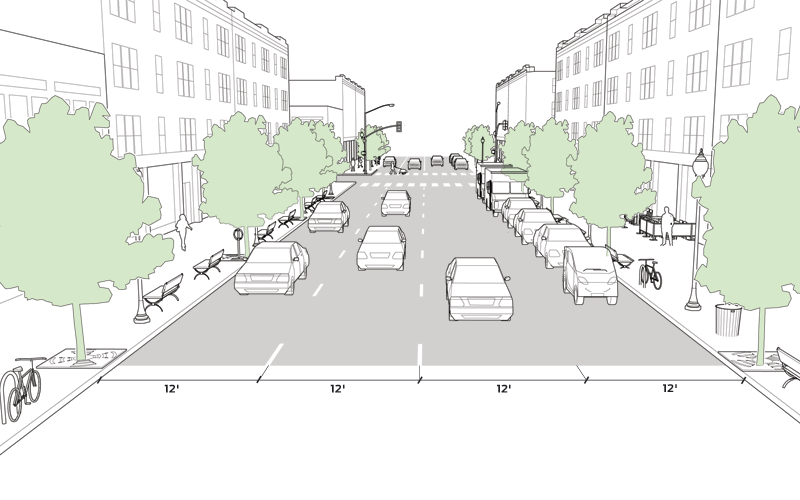 As such, it is supposed to be a focal point for walkable development. Because regional town centres as supposed to be walkable and contain higher densities than other parts of the region, they are supposed to be connected with high-quality transit service. Looking at Willowbrook today, it would appear to be as far removed from the vision of a town centre as possible. Of course things are slowly changing. One of the biggest changes is the proposed redevelopment of the Willowbrook Mall that will be integrated with the new transit exchange. The proposed plan would transform the mall (and more importantly its parking lot) into a walkable core. 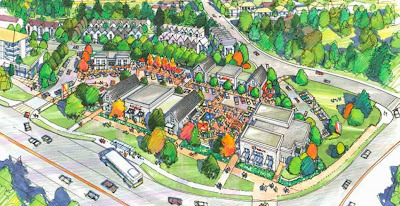 The Township of Langley has also selected Willowbrook for high density development that could surround the new core and transit exchange. Today much of Willowbrook around the mall contains older auto-oriented commercial buildings that are ripe for conversion into a more walkable and sustainable form. As many of the property owners are starting to redevelop their sites, Township Council will need to be vigilant to ensure that redevelopment will support the goal of creating a town centre. View from 64th Avenue of proposed new commercial building at Langley Crossing Mall. 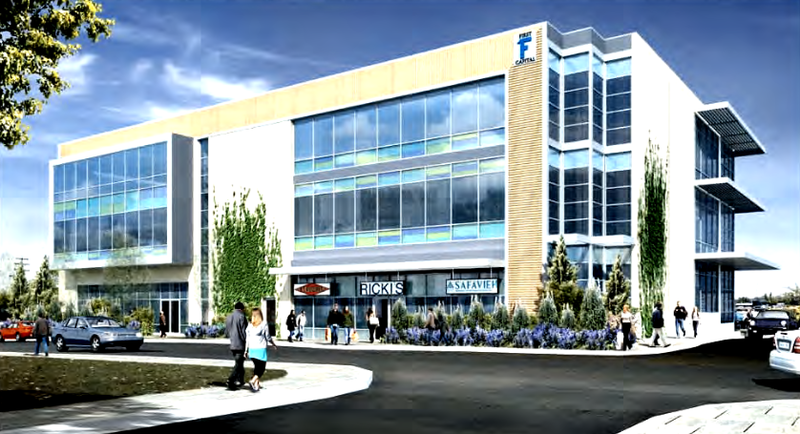 A recent redevelopment proposal by First Capital for their Langley Crossing strip mall (which is on the southwest corner of 200th Street and 64th Avenue) would see one of the current one-storey commercial buildings be replaced with a three-storey commercial building. 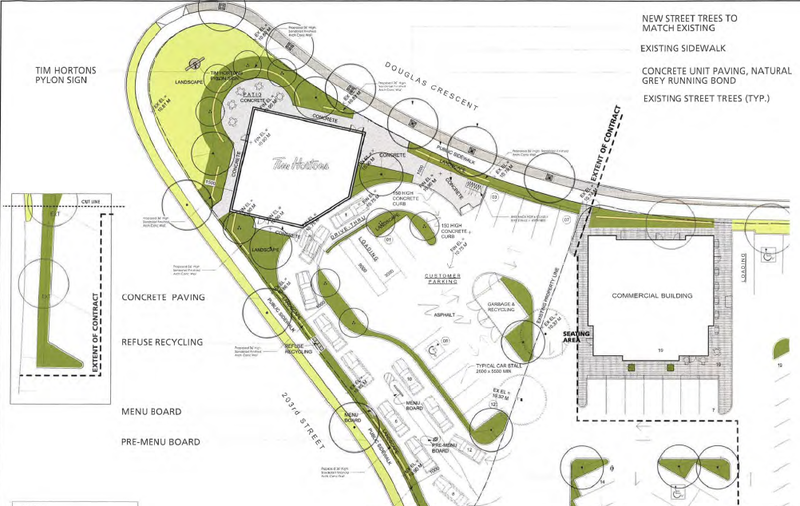 Site plan for proposed new commercial building at Langley Crossing Mall. Will replace building that currently houses De Dutch Restaurant. Click image to enlarge. As you can see by the rendering of the proposed building, it will front 64th Avenue and can support the creation of a walkable street. While I’m sure that most people will visit building tenants via the parking lot at first, hopefully as the area becomes more walkable, the street-front will become the primary entry point. The Township of Langley must ensure that any building that fronts a street in Willowbrook be pedestrian accessible from the street. One of my concerns is that as property owners redevelop their sites in Willowbrook, the Township will still allow auto-oriented projects. If the Township continues to allow auto-oriented design, our regional town centre will not live up to its full potential for at least another 20 years. Proposals like the First Capital redevelopment are a step in the right direction. This Sunday, I had some time to spare between arriving in Surrey City Centre and an appointment; I decided to take a walk around Surrey’s transforming downtown core. Sometimes it's the small things that matter the most. The first thing that I noticed was that Surrey is starting to install mid-block pedestrian crossings along King George Boulevard. While I’ve heard some safety/liability excuses about why other communities don’t install mid-block crossing, they are key to laying the groundwork for a walkable community. One of the challenges with Surrey and other post-1950’s communities is that they have long blocks. Because of these long blocks without mid-block crossings, walking from one side of the street to the other side takes too much time and becomes a hassle. Surrey has a longer-term goal of creating a tighter grid of streets in its core, but adding mid-block crossings is a good transitionary step. Another step Surrey needs to consider along King George Boulevard is to widen the sidewalks and plant more trees to provide a buffer and compensate for the high volume of traffic and road width of the boulevard. Looking east; new mid-block crossing on King George Boulevard at 103th Avenue. Click image to enlarge. Looking west; new mid-block crossing on King George Boulevard at 103th Avenue. Click image to enlarge. Another key to creating a walkable community is to manage on street parking. 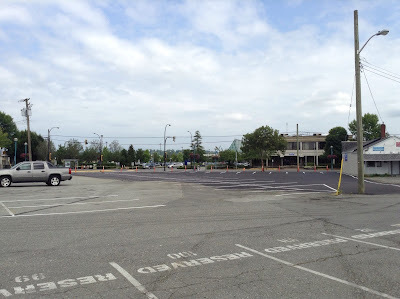 By managing on street parking, minimum parking requirements that create massive on site parking lots that limit reuse and create pedestrians dead-zones can be reduced or removed. 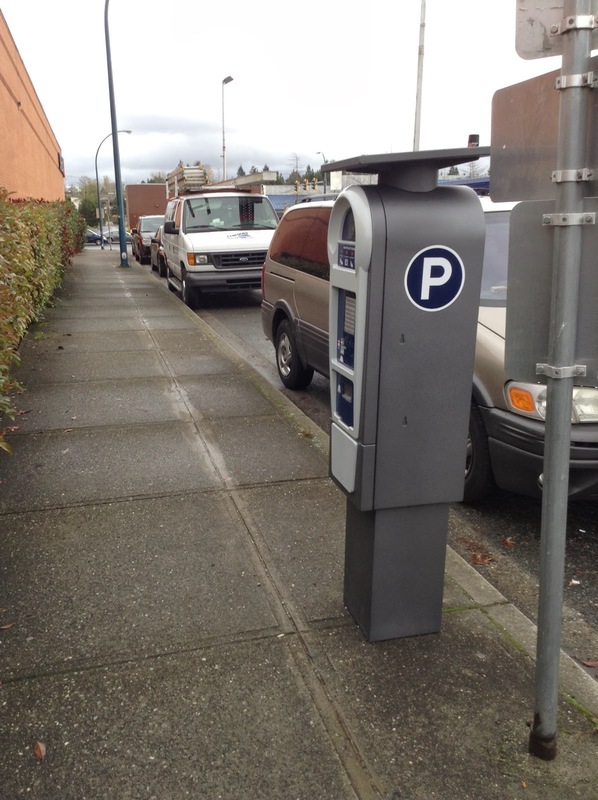 While on street parking is not a limited resource in Surrey's core today, by introducing paid parking now, the City is being proactive and avoiding possible future political battles when on street parking becomes a limited resources. While there is compiling evidence which shows that managing on street parking is good for business, many business owners have initial concerns and are usually very opposed to paid parking until they see how its benefits their business. On street parking pay station in Downtown Surrey. Click image to enlarge. Seeing the slow transformation of Whalley from a typical 1950’s auto-oriented community into a walkable core gives me hope for the rest of the South of Fraser. It is refreshing to see Surrey’s commitment to building a walkable community. -Ensuring ministry programs and activities are focused on achieving government's vision of a strong economy and secure tomorrow. -Confirming government's core responsibilities and eliminating programs that could provide better service at less cost through alternative service delivery models. -Ensuring public-sector management wage levels are appropriate. Bill Bennett was appointed as minister responsible for the core review. In August, Bennett was quoted as saying, “We’re going to look at some sacrosanct things, like certain agencies. We’re going to look at the Agricultural Land Reserve and the Agricultural Land Commission.” This was the first hint that the government was looking at substantially changing how (and if) farm land is protected in BC. Last week, a cabinet document was leaked which talked about a plan to breaking up the ALR. Another letter leaked by the NDP this week noted that the government had instructed the ALC to not start a major boundary review of the land reserve. "Given the current core review process that is under way, I believe it would be prudent, during the period of the core review of the ALC and the ALR, to defer any ALC decisions that would fundamentally affect the ALR (for instance, inclusions or exclusions of major blocks of land)"
It was also revealed this week that Agricultural Minster Pat Pimm was trying to politically influence the ALC because of a land-use decision that affected one of his constituents. With current government threatening to dismantle the Agricultural Land Reserve, I thought it would be a good time to repost a piece I put up on the now defunct Metro604 blog. What is happening on Tsawwassen First Nation land today is really a canary in the coal mind; it shows what will happening throughout our region if the ALR is dismantled. Several months ago on my way to the Tsawwassen Ferry Terminal, I noticed that major construction was taking place on Tsawwassen First Nation’s (TFN) land on the north side of Highway 17. I decided to look into what is going on in the area. If you’ve been following stories in the media lately about transit, there has been renewed fear about safety and security while on the transit system. 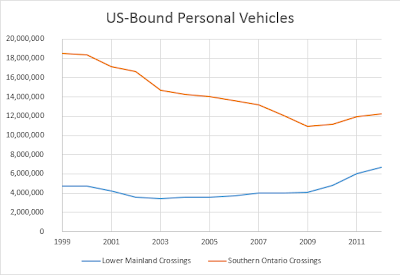 I’ll be the first to admit that there is crime on our transit system (as I have been party to it), but sometimes it is good to step back and look at real vs. perceived safety and security while on transit. Todd Litman of the Victoria Transport Policy Institute recently published “Safer Than You!” which explores safety and security of transit systems. Taking transit is hands down the safety mode of transportation. 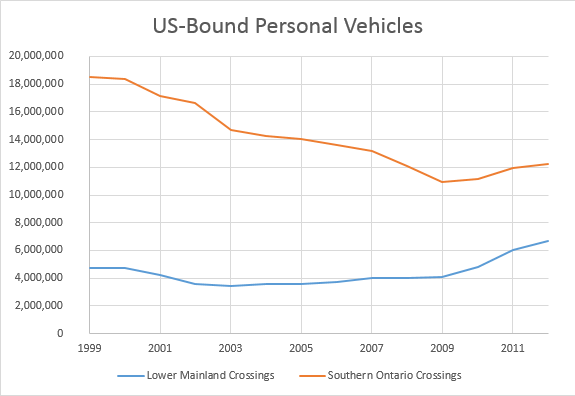 The following graph shows the contrast between urban transit deaths versus automobile deaths per billion passenger kilometres. Clearly being in a car is the least safe mode of transportation. In fact, only riding a motorcycle is more dangerous. Litman also presents an interesting graph that shows deaths caused by automobile, strangers, and acquaintances. Again death caused by traffic collisions are on a completely different scale than murder caused by strangers or acquaintances. Interestingly, we have been lead to believe that strangers and transit should be feared, but it’s actually people we know and driving that have a significantly high chance of causing harm to us. When it comes to overall crime, Litman suggests that transit-friendly communities actually have an overall lower crime rate. In fact, vehicle-related crimes have a higher cost to society than crimes that occur on transit. Improving transportation options and smart growth development polices can help create a positive security cycle of more responsible (no-criminal) urban resident, increased use of active and public transport modes, improved urban service, increase economic opportunity for at-risk residents, reduced crime rate, reduce fear, and the stigma of urban living In fact the more legitimate users there are of transit, the more safely the system become. About a month ago, Port Metro Vancouver hosted a small group meeting in Langley to talk about and receive feedback on the proposed Roberts Bank Terminal II expansion. This meeting was part of the Port’s consultation processes which is running in tandem with the federal environmental assessment processes for this project. One of the main concerns from the small group meeting I attended was the scope for the environmental assessment. Scope is important because it lets the Port know what impacts that they need to consider and propose mitigation measures for. One of the main concern in Langley was the impact the Port will have due to increase rail and road traffic. The Port must consider air quality, noise, lighting and climate impacts as well as the impact the proposed expansion will have on the rural and urban settings, but only as it relates to the scope defined in the EIS. Because of this, the EIS is one of the most important documents as it guides the whole assessment processes. One of the key issues for the region in the impact caused by the transportation of good to/from the Port, but the draft EIS states that only “marine, road and rail transportation within the port’s jurisdiction” will be considered. I believe that rail transportation outside of the Port’s jurisdiction, but is solely serving the Port must also be considered as part of the environmental assessment. As railways are federally regulated, this should fall within the scope of a federal environmental assessment. If this is not considered, a large portion of the impact the Port will have on the region due to the proposed terminal expansion will be exempt from review. Now that the draft EIS has been publish, the general public has 30-days to comment on it. If you would like to make your views known, I suggestion you visit the webpage that the CEAA has setup for this project. One of the things that I’m excited to see in the plan is the recognition that our on-street road network needs to be connected to our off-street trail network. 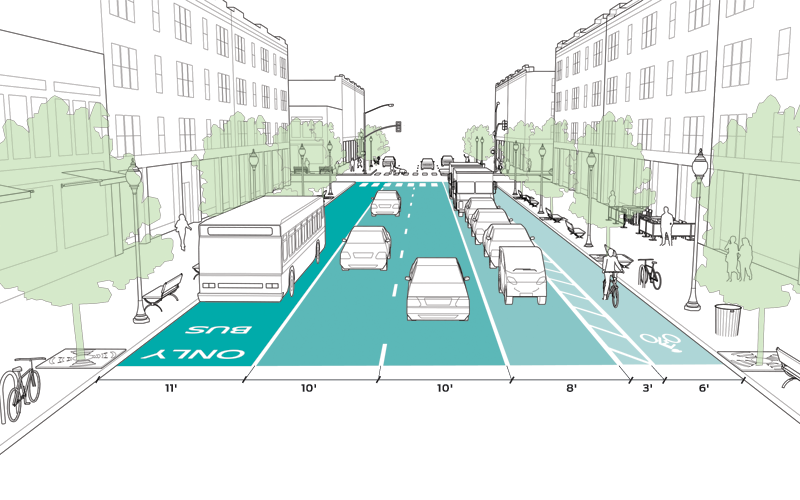 This plan recommends that the on-street pedestrian and bicycle network be improved and connected to the off-street network. I’m happy to see that the draft of the forthcoming Master Transportation Plan also recommends improving the on-street and off-street pedestrian and cycling network. Of course a plan is just a piece of paper without funding. Since I’ve lived in Langley City, cycling and pedestrian infrastructure funding has not been a priority; I hope this will now change. 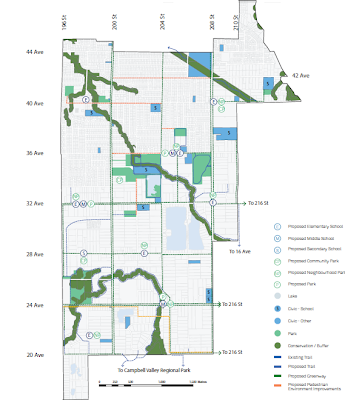 One of the odd things in the Park, Recreation, and Culture Master Plan is the recommendation that more green space be included in multi-family developments. Having lived in multi-family housing for almost half my live, I can say that this semi-private green space in usually under-utilized and can create “dead zones”. For some reason there is this still this notion that higher-density development need green space. Sadly it was this notion that helped create some of the worst public housing projects in North America. The reality is that people will use private green space and public green space. Successful higher-density communities need great public parks. Instead of requiring developer to put in semi-private “dead zones”, fees collected from developers should be used to make sure that we have high-quality parks. At the end of the day it’s about quality and not the quantity of green space. The plan does recommend improving the quality of the parks in Langley. When it comes to recreation facilities, the highest priority is to complete the design and construction of the new Timms Community Centre. Right now the site of the Timms Community Centre (beside City Hall) is an empty concrete slab. Another high priority area is to continue working towards the creation of an artist and cultural space in the Langleys. The Park, Recreation, and Culture Master Plan is contained in the latest Council Meeting agenda. The Carvolth Neighbourhood Plan represents a vision and implementation framework for creating a transit oriented, walkable and highly urban place at this important gateway to the Township of Langley. The new neighbourhood is envisioned to have a high quality of design and a balance of jobs and housing and be a regional showcase for sustainable design. What better way to celebrate the 1,500 post to this blog then to talk about the Carvolth Neighbourhood in the Township of Langley. Originally the plan for this neighbourhood in Willoughby was for your typical auto-oriented office parks, but the addition of the Park and Ride at 202nd Street, and ExpressBus service over the Port Mann Bridge, allowed the Township to rethink the neighbourhood as a transit-friendly, walkable community. I’ve been following this neighbourhood update for some time, and I was pleased to see that Township Council adopted this new walkable plan earlier this year. The Township of Langley recently released an eight page brochure that lays out the vision for the neighbourhood and is well worth the read. The community could include a variety of housing options including mixed-use, live/work units, apartments, and townhouses. It could also include a diversity of retail and offices opportunities including the creation of a high street on 86th Avenue. 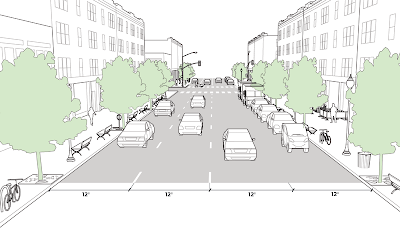 What the Carvolth Plan clearly shows is the link between land-use and transportation. It also shows that in order to build a transit-friendly greenfield neighbourhood, the transit network has to be in place around the same time as the neighbourhood is being developed. I was told the other day that the Carvolth Park and Ride facility was designed to accommodate ten years’ worth of growth, but it is already near capacity today. This is pretty amazing considering there is both a $2 per day or $40 per month parking fee plus transit fare needed to use the facility. This shows that people prefer to take high-quality transit over driving. In fact, I’ve been told this by many people that living in Walnut Grove and Willoughby. Contrast this to highway projects were the introduction of even a minor toll causes traffic levels to plunge, and I have to question why transit isn’t made a priority by the province for our region. The fact is that the introduction of high-quality transit service has consistently over-exceeded usage predictions while highway usage prediction have not been met in Metro Vancouver. 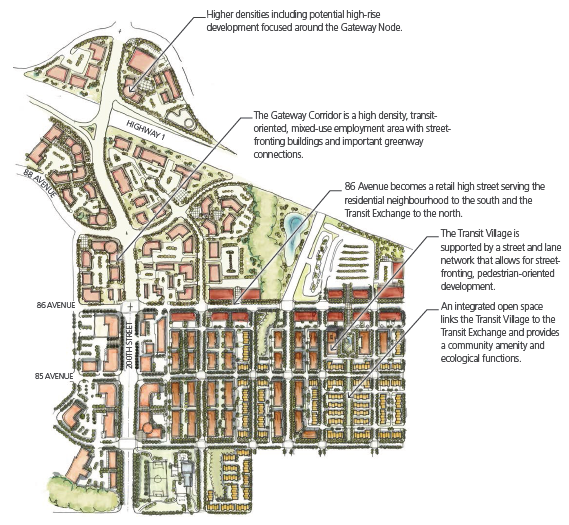 While I believe that the Township has an amazing opportunity to build a new walkable community, the municipality will have to be careful about the phasing. I’ve seen far too many great projects in the Township derailed by people who move to the Township and then opposes any higher-density projects. The Township must ensure that the high street and some higher-density projects are in place before allowing medium-density projects to be built in the neighbourhood. This will do to things. First, it will calm people’s fears that higher-density projects are evil and show that they are actually vital for a walkable community. It will also limit anti-growth sentiment that always seems to pop up when new lower-density projects are established before high-density projects. If the Township get the timing of projects right, I believe that Carvolth has a bright, sustainable future. Early last month, I attended a small group meeting that was hosted by Port Metro Vancouver about the proposed Roberts Bank Terminal 2 project near Delta. You can read about this meeting on a previous post, but the short story is that a lot more trains will be using the Roberts Bank Rail Corridor. Langley is unique because it is the only part of the region were the rail line goes through a dense urban area. Because of the massive increase in rail traffic, $300 million is being spent on overpasses along the corridor to try and mitigate road congestion that will result from the increased rail traffic. Unfortunately in Langley, Fraser Highway and 200th Street are not part of this mitigation plan. There is also concern that this increase in rail traffic will result in increased diesel emissions which have been linked to premature death in the very young and elderly. The emissions are also linked to increased cases of asthma. As Langley City has a higher-than-average seniors population, this is of great concern. Roberts Bank Rail Corridor. Click image to enlarge. One of the major concerns that we had at the small group meeting was how the Port was going to mitigate the impacts of increased rail traffic due to the proposed Terminal 2. Unfortunately, we were told very little at the meeting. We had other questions that the Port couldn’t answer at the meeting as well. Late last Friday, the Port replied to some of our questions. What percentage of the containers that land in Vancouver are destined for the local market? Approximately 10% of the goods that land in Vancouver stay in B.C. What percentage of containers leave Deltaport by rail? What percentage leave by truck? Approximately 2/3 of import containers that land at a marine container terminal in Port Metro Vancouver are loaded onto trains and leave the container terminal within 3 days. The remaining 1/3 leave by truck. 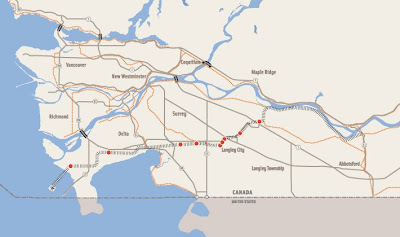 How many level crossings are there between Langley and Deltaport? There are 30 level crossings between Langley and the Roberts Bank terminals, 9 of which are being addressed as part of the Roberts Bank Rail Corridor Program. Of the approximately $300 million that was spent on the Roberts Bank Rail Corridor Projects, how much did each partner contribute? Besides the Rail Advance Warning System being developed as part of the Roberts Bank Rail Corridor Program, are there any additional information systems in place or under development to alert drivers to imminent train traffic? There are no other information systems planned other than TransLink’s Rail Crossing Information System that is currently under development for Surrey and the Township of Langley. One of the things that becomes clear from these answers is that rail will remain the preferred mode of transportation for goods that pass through the Port. Interesting to note is that government is paying for 73% of the cost to mitigate some of the impacts of increased rail traffic from privately owned railways. Also worth noting is that only 30% of the rail crossings are addressed in the Roberts Bank Rail Corridor program. While I believe that rail is the best way to move goods, considering the massive increase in rail traffic which will results in longer delays at level rail crossings and increased locomotive emissions that will impact human health, more needs to be done. Some of the things that could be considered are trenching the railway through urban areas like they do in Los Angles. Even electrifying a portion of the rail line that goes through Metro Vancouver should be considered to reduce deadly emissions. These are all possibilities that would allow the free-flow of goods while preserving the quality of life for people in our region.